It’s summer in the city – long nights, short dresses, sweet cocktails, and a million reasons to throw caution to the wind and stay out for one more song, one more drink, one last train. 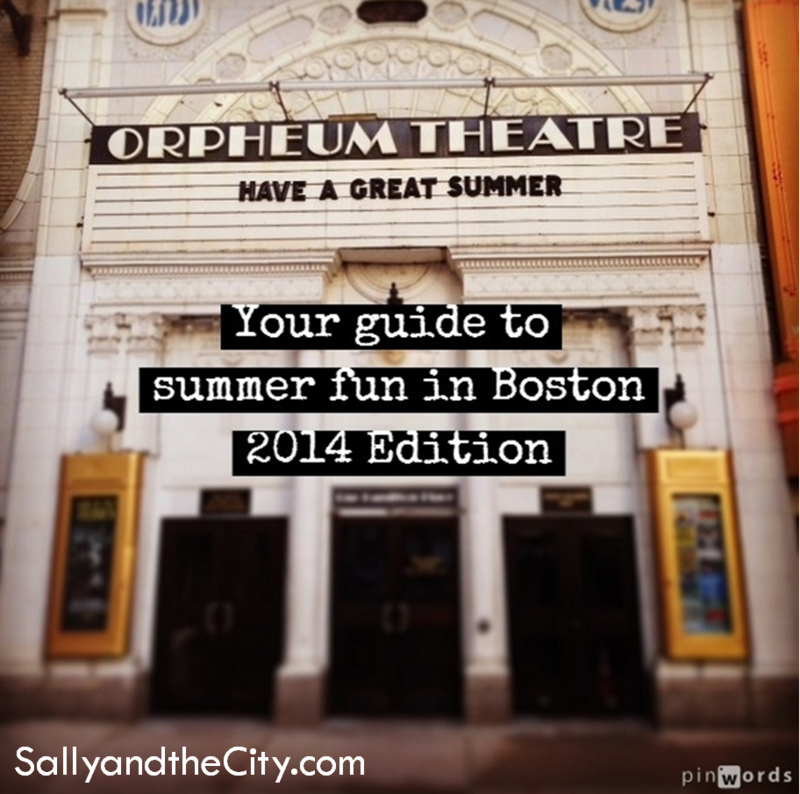 Here’s my starter guide to having a stupendous Boston summer – where to go and what to do to ensure that you’re making the most of these next glorious weeks. I’ll add more items as I hear of them! Free films and music at the Boston Harbor Hotel: BHH has an amazing summer series of music and movies that can be enjoyed for free. Get there early to get a seat at their restaurant, and take in some tunes while watching the sunset over the harbor. Concert series at Post Office Square: Check out free tunes at Post Office Square, a mini oasis in the city. Shakespeare on the Common: Get cultured on the Common with Commonwealth Shakespeare Company and their performance of Twelfth Night. You can catch my friends and me there on August 5! Free nights at the ICA: Tap into your artsy side with free nights at the ICA – perfect for dates of the romantic or BFF variety! Free Friday Flicks at the Hatch Shell: pack a picnic (or buy one at nearby Whole Foods) and take in a film along with thousands of other Bostonians at the Hatch Shell, right next to the Charles River. Free exercise classes at Post Office Square: Before work, during lunch, after a long day – take a break and work out with one of the free classes in Post Office Square. I went to their boot camp all last summer and it was incredible – great community and quality classes for free! Get a Sweetgreen passport: check it out to find free exercise classes and events near you. Join the November Project: Check out this fun group and attend one of their high-energy outdoor workouts – rain, shine, show – they never stop! Swim in the sunset at the Rooftop Pool: the Rooftop Pool (RTP) at the Colonnade Hotel lets you swim for free in the evenings – or just dangle your legs in and enjoy a mojito, your call. Run on the Freedom Trail: Sometimes you think you know your neighborhood, but there’s more history than you can imagine, right beneath your feet. Join a Freedom Trail Run and get an insider’s view of Boston’s rich past, while picking up your heart rate in the process. Explore the Boston Harbor Islands: from forts to fries to glittery beaches of sea glass, the harbor islands are the perfect way to spend a sunny Saturday. I recommend going out to George’s Island and then stopping at Spectacle on the way back. Cool off at the Boston Public Library: In addition to hosting every book in the world (true story, I checked), the BPL also has a beautiful courtyard, a cafe, and a great array of exhibits and events, not to mention some pretty strong air conditioning. Ride the Swan Boats: Head over while it’s still under $3 and take a ride on Boston iconic swan boats (dare I call them the proto-duck tour?). The ride is short but sweet, and it will make you appreciate the many flowers in bloom and wildlife in the Public Garden. Seek out the best ice cream in town: It’s a hard job, but somebody has to do it – search out some of the best flavors in Boston ice cream, from Toscanini’s in Central Square to Christina’s in Inman to JP Licks… everywhere. With options like rose, burnt caramel, and coffee oreo to choose from, this challenge has no losers. Enjoy the student-free city: take in the areas that are painful during the school year (Harvard Square, anyone? The entire Green Line?) and enjoy owning a small slice of our city by yourself, rather than always sharing it with a mob. 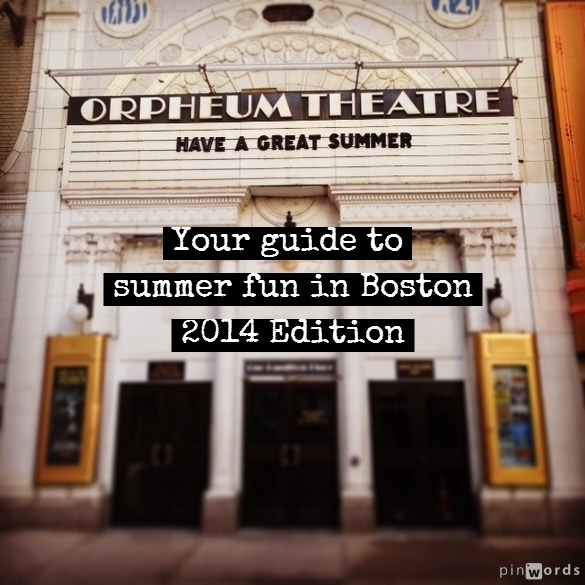 What else are you loving about Boston this summer? Post in the comments below! And have fun out there! – SOWA Sundays – awesome vintage and craft market in the South End, with food trucks galore and tons of delicious things and great gifts to leave your wallet utterly empty. I don’t know if I’ll still be here in another 5 years – maybe I’ll give into the temptation to live in Europe, full-time. Maybe I’ll buy a cute house to fix up in New Hampshire or Maine. Maybe I’ll be prepping to take on the Presidency in DC. Who knows! But I do know that there are more adventures to be had in this city, and I plan on living it up, one delicious summer day at a time. Thanks for everything, Boston – looking forward to round 2! Right now, runners are lining up on the Boston Common, waiting to get onto buses that will take them to the start line in Hopkinton, MA. They’re filling the local Dunkin Donuts, snarling morning traffic, and stretching in the sunlight that promises that today will be a great day for running. It’s hard to imagine that a year ago today, we had just survived one of the weirdest, probably worst weeks in Boston history. First the bombing at the finish line, then the manhunt that kept us huddled in our houses, trying to leave the streets free for police officers. And yet, we stayed strong. We left shoes and roses at the crime scenes. We paid tribute to the fallen. And we kept running. On Saturday, my mom and I ran the first Boston Athletic Association (BAA) event of the year, the BAA 5k. The race usually has 5,000 people in it – this year it had closer to 10k. We were still at the start line when they started frantically clearing people out of the way because the winner was about to come in (we left the start 11 minutes after the initial start – he came in at 13:26). It was a powerful show of the depth and heart of the running community, to have so many people out so early in the morning to jog together. As we ran down Boylston, I had flashbacks to a place I’d never even been – to what it must have been like for the thousands of people who were on this street last year, leaving their hearts on the pavement and seeing the finish line at the end of the road, only to have their moment of victory shattered. It was scary to go across the finish line, even on a sunny Saturday. I can only imagine what it will feel like today. I am so proud of our city for how we’ve come together in this last year. So excited for my friends who are finally going to get to finish that final mile. And so grateful to be a part of a community that isn’t afraid to keep running with our heads held high, no matter what obstacles enter our path. I’ll be there at Kenmore, cheering you on! Read my blog post on last year’s Marathon Monday. I know it makes me sound like an old fart, but I don’t care: I don’t know where this year went. Getting to see 4 great friends marry the loves of their lives and start their happily ever afters, and seeing others get engaged and plan their own bashes! Going to my 5-year college reunion and realizing, more than ever before, how much my beloved alma mater and the friends I made there mean to me. Mount Holyoke forever shall be! Having extraordinary fun with ordinary life – from our annual Oscar party to weekly breakfast with Sara to trivia nights with Katie and the gang to joining TWO social sports teams (volleyball! softball! what will I do in between??) to dinners out with friends, this year has been full of reminders of the joy that can be found in the everyday moments. Aka reason #89763 that I love my job. 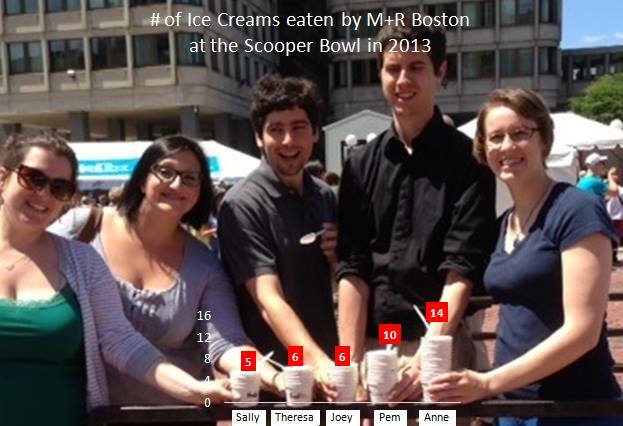 Run, don’t walk, to the 2013 Jimmy Fund Scooper Bowl in Boston’s City Hall Plaza – it runs from 12-8 today! This is my city. My library at Copley Square with the beautiful courtyard. My land of parks scattered with historical plaques and uneven bricks. My running trails, my ancient subway. My marathon. This morning, my mom and I went running for our half marathon training. We had 10 miles to do – my longest run yet. When I mapped it out last night, my route had us going along the Charles, through the city – and either starting or finishing at the marathon so we could cheer on the friends and strangers who were taking on those daring 26.2 miles this year. When she got here today, we decided to scrap that plan – we would instead head downtown and run along the river and then home. We would cheer on the runners in our hearts and with our steps. And when we got home, we would head over to see how our friends were doing. But at the end, we were so exhausted that we stayed in my neighborhood for a celebratory late lunch, and we had just returned to my apartment when we heard the terrible news from Copley Square. The people who were crossing the finish line at that hour – 4 hours+ into the race – were not elites. They weren’t in it for the glory. They were in it for charities, to prove something to themselves and to the world. And the people who were there cheering them on were heroes – the people who don’t just clap for the professional runners who make the sport exciting, but who instead opt to be there for the people who need them most, who need that cheer to propel them across that finish line. The idea that someone would take this day, this remarkable moment of people coming together and surrounding each other with friendly competition, tributes to athleticism and endurance, testaments to challenges and triumphs – and turn it into a tragedy baffles me. We are better than this, humanity is better and we can do better. The pictures of people running toward the blast, helping runners, picking each other up off the ground, prove this. I am grateful that my loved ones are safe following this terrible violence, but I know there are people still waiting for news or dealing with this tragedy personally. What we lost today at that finish line was a sense of security, balance, and peace that should come from a unifying event like this. But what we gained was resolution – we will look after each other, we will carry on, and together, we will take on the evil in the world and drive it out with good because really, there’s no other choice. Have a place to offer? If you’re in Boston for the marathon and need help, please leave a comment below and I’ll do what I can! Helped elect a great woman to serve as MA’s first female Senator – soon to be the senior Senator from Massachusetts. Go Elizabeth Warren! All that, and more made up my 2012. Now I’ve got even bigger plans for the year ahead – stay tuned, more on that tomorrow!